Things I Wish I'd Have Known When I Started. In this game, the dinosaurs have needs. If the paddock does not meet those needs, then the dinosaur's comfort level will lower and the it will try to breach. All paddocks require land, and if there's not enough of it, then your dinosaurs will not be happy. If there is not enough land in the paddock area and you want to resolve this issue, you will have to increase the amount of land in the paddock area, but not by removing water and replacing it with land. You have to actually increase the size of the paddock, this is because water still stands as land because dinosaurs can walk through it. This one is simple, your dinosaurs need to drink, so they need water. If they don't have any or enough water, just make some in the terraforming tab. Both diets, herbivores and carnivores, require forestry. Carnivores require it less, because they only eat meat, but they will like it more if there is forestry in their paddock as they like to stalk, hunt, then eat their prey. All animals need nutrients, and for dinosaurs, they require food. As you should know, herbivores eat plants, carnivores eat meat, and omnivores eat both. To feed your animals, you will need feeders. For carnivores, you have to choose between the live feeder or the carnivore feeder. I would reccommend the live bait feeder, because then the carnivore can stalk their prey. For herbivores, they require feeders that fit their size. Large dinosaurs require the tall herbivore feeder, and medium to small dinosaurs require the small herbivore feeder. As of me writing this review, I do not believe there are any omnivores in the game. All of the dinosaurs have requirements, and each dinosaur has different requirements. All dinosaurs need to socialize, but some need to socialize less, and some more. If your dinosaur's social requirements are in the redzone, you need to either add more dinosaurs of the same species to the paddock, or place some of the same species in a different paddock. 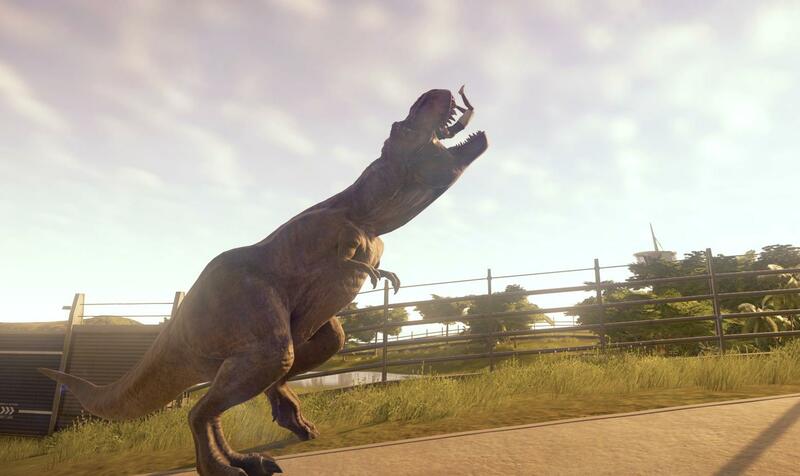 Velociraptors require alot of socialism, so keep that in mind when you build a raptor paddock, because if there are not enough other raptors, they will breach - and they are DEADLY. Some dinosaurs don't mind being in a dense paddock, whilst some do. If your dinosaur is uncomfortable in their paddock, either because there are too many dinosaurs, or not enough, you must either add or remove dinosaurs from the paddock. This is very similar to the rules of the social requirements, except the dinosaurs you either add or remove do not have to be the same species. Your dinosaur rating is something you want to get right. If your dinosaur rating is high, more people will see your dinosaurs, then have fun, and as a result, your park rating will increase. Every dinosaur you birth will increase your dinosaur rating. If you want to increase your dinosaur rating more, you will need variety, originality, and modified dinosaurs. For variety, you need different species of dinosaur in your park; or originality, you need original, unmodified dinosaurs in your park; and for modification, you need dinosaurs that have modified genes in your park. You can't just have 2 or 3 dinosaurs in your park, you need more, lets say... at least 15. This will keep your guests moving about, and if you place enclosures far from each other, with shops in between, guests will go to an enclosure; walk to the next enclosure; and, on the way to the next enclosure, buy merch, food, ETC. Here are some things I learned through my playtime that I think you should know. If you are taking the game more seriously, or simply just don't have a lot of time on your hands, add tasks to your ranger teams / ACU instead of hand-controlling the vehicles. If you do this, it should save you time; allow you to do more things at once instead of worrying about other issues; prevent more people from, y'know, getting eaten, and whilst doing that, also prevent your park rating from going down. It may even save you a bit of lawsuit money. Max out your safety bunkers, even on the first isle. On the first isle, I didn't even have 1 bunker until a few hours in. Don't make this mistake, max out your safety bunkers. There may not be many storms or power outtages but your dinosaurs, eventually, will breach, and trust me - if someone dies, lawsuit money will cost you a lot. And if your guests are in a concrete enforced, triple-locked underground bunker, I don't think any dinosaurs will be killing anyone.